wildly exaggerated mental ability of Jimmy or Dexter — or Herbert Weems, for that matter — is probably an artifact of the technological age. Jimmy also differs from Dexter in important ways. Jimmy is a more-or-less normal kid (he even has stupid friends) who just happens to be a super-genius; whereas Dexter is a weirdo from the get-go, starting with being so arrogant and ill-tempered about his brains, he has no friends. Exacerbating that situation is his extreme lack of social skills. Also, he talks like the evil genius in an old movie serial, complete with a thick middle-European accent (first supplied by voice actress Christine Cavanaugh, who also did Chuckie in Rugrats and Bunny Rabbot in Sonic the Hedgehog) that couldn't possibly have come from from his home life. That home life included Mom (voiced by Kath Soucie, who has also, among other things, been a villain in Static Shock), Dad (voiced by Jeff Bennett, who also did Johnny Bravo) and especially Dee Dee, the older sister who blighted Dexter's life. Dee Dee was originally voiced by Allison Moore, who has only a few scattered voice credits, but the role was later handled by Kat Cressida, also heard in sequels to Disney's Tarzan. Also part of the home was the Laboratory itself, a vast complex, apparently far larger than the house itself, hidden behind a book case in his bedroom. The show was created by animator/director Genndy Tartakovsky (Samurai Jack). It first appeared as the February 19, 1995 episode of Cartoon Network's What a Cartoon! show, which mixed new episodes of old series such as The Flintstones or George & Junior with new ideas being tried out, such as Cow & Chicken, Courage the Cowardly Dog and Dexter himself. Dexter began starring in his own series on April 28, 1996. Production was done by the Hanna-Barbera studio. Over the next couple of years, Dexter had many adventures, sometimes tangling with his arch-enemy, Mandark, voiced by Eddie Deezen (Alvin Yasbek in Mighty Ducks). Mandark's alter ego was Susan Astronomonov, also a boy genius, and his animus began when Dexter made fun of his first name (cf. Johnny Cash's "A Boy Named Sue"). Recurring guest stars included The Justice Friends, whose name was obviously intended as a play on The Justice League and The Super Friends, but the group also had similarities to The Avengers. 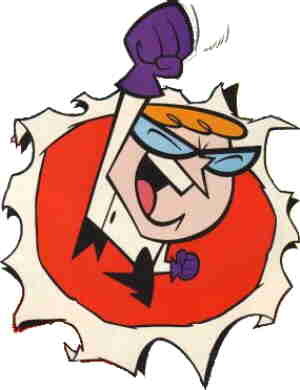 One of its members was a monkey caged in Dexter's Lab, tho Dexter never suspected he had a secret life as a superhero. The character also starred in Dial M for Monkey, a back segment included in some early episodes of the show. Monkey's voice was done by Frank Welker (Jabberjaw). The Justice Friends later guest-starred with The Powerpuff Girls. The show went off the air in 1998, but came back as an hour-long TV movie, Dexter's Laboratory Ego Trip, on December 31, 1999. In 2001, the regular series came back, this time with production done by Cartoon Network's own facilities. Cavanaugh was replaced as Dexter's voice by Candi Milo (several voices in Carmen Sandiego and Pirates of Darkwater). The revival ran two additional seasons. Altogether 76 episodes were made. DC Comics did a comic book version of Dexter for 34 issues, dated between September, 1999, and April, 2003. Also, Dexter made a few cameo appearances in other cartoons, including The Grim Adventures of Billy & Mandy and I Am Weasel. He's had his share of merchandising, including many episodes available on home video. Text ©2007-10 Donald D. Markstein. Art © Cartoon Network.